Garthwaite, Anna Maria. Design for silk weaving. Watercolor on paper. 1747. Victoria and Albert Museum. Save for a few biographical tidbits, very little is known about the life of Anna Maria Garthwaite (1690-1763), the daughter of a clergyman who left home in 1726 to live with her widowed sister. 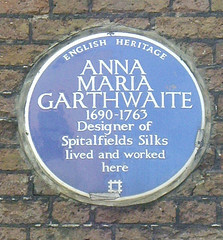 In 1728 the pair moved to the Spitalfields district in London, where Anna Maria would work as a freelance artist, creating over 1,000 watercolors throughout the course of her career, which she sold directly to the local master silkweavers. Many of those designs have been preserved at the Victoria and Albert Museum, and some even include technical instructions, date, and to whom the design was sold. 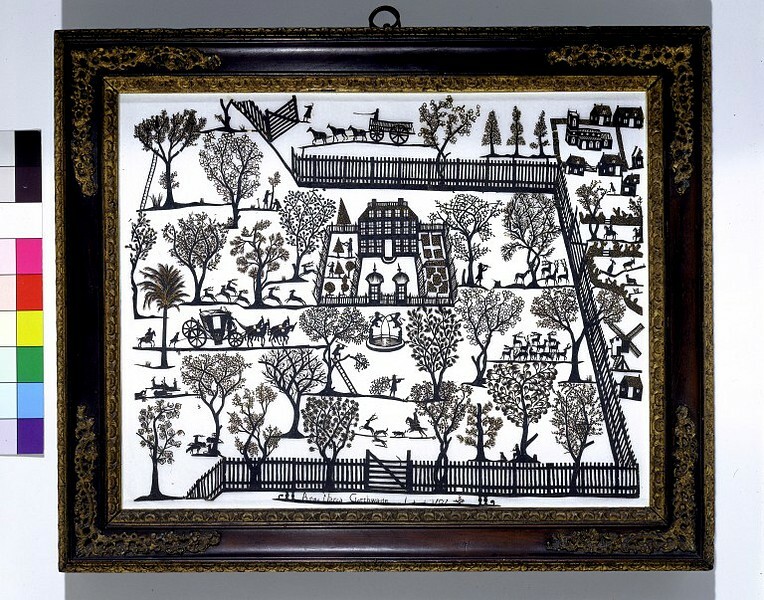 It is not known how Anna Maria developed her artistic skills, although there is early evidence of her abilities in a papercut that can be found at the V&A. Garthwaite, Anna Maria. Papercut. 1707. Victoria and Albert Museum. However, there is a great disconnect between a papercut done by a teenager and a sophisticated understanding of how silk weaving could translate a design on paper. It is nothing short of intriguing that a spinster with no formal artistic education could not only penetrate England’s silk weaving industry, but be a major influence on textile production. Anna Maria created watercolors, which were sold to the weavers, who would transfer the designs to the loom. 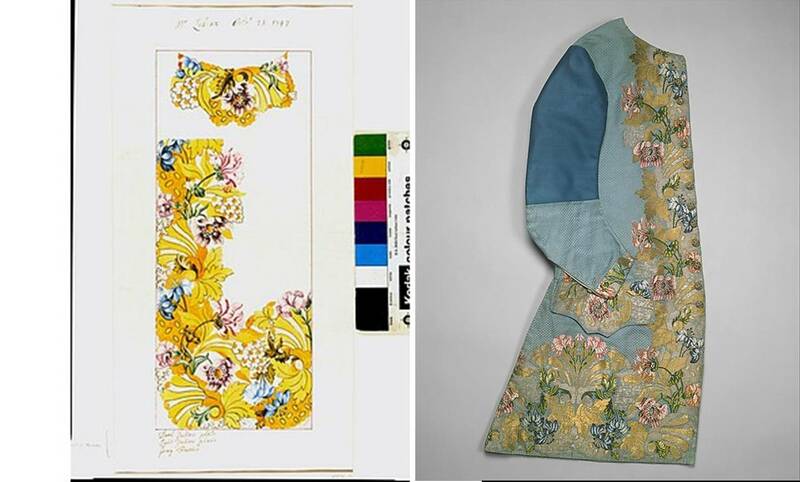 While the V&A houses over 800 of Anna Maria’s watercolors, there are a handful of surviving garments and textiles that can be matched to her designs. Anna Maria’s design for a man’s waistcoat, which was sold to master weaver Peter Lekeux, and the resulting garment. Left: Garthwaite, Anna Maria. Design for silk weaving. Watercolor on paper. 1747. Victoria and Albert Museum. Right: Man’s Waistcoat. Textile by Peter Lekeux, design by Anna Maria Garthwaite. Silk, wool, metallic. 1747. Metropolitan Museum of Art. 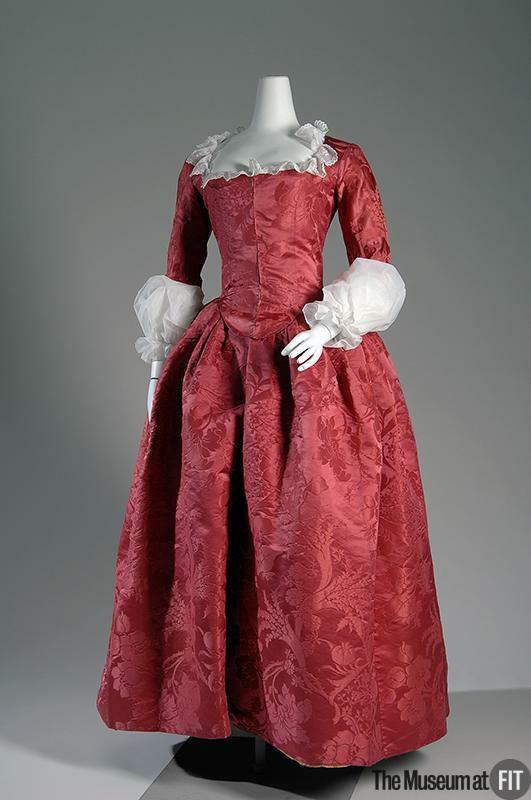 Anna Maria’s design, dated April 22, 1744, was sold to Mr. Gregory, who wove the silk. As with many gowns of fine materials, those made of Anna Maria’s designs were often cut and altered for new wearers or to reflect changes in style. Left: Garthwaite, Anna Maria. Design for silk weaving. Watercolor on paper. 1744. Victoria and Albert Museum. Right: Woman’s gown. Textile design by Anna Maria Garthwaite. Brocaded silk. Made 1744, altered 1780s. Victoria and Albert Museum. Fabrics made from Anna Maria’s designs were so prized they were cut and altered into more fashionable silhouettes as much as a full century after they were woven. Left: Garthwaite, Anna Maria. Design for silk weaving. Watercolor on paper. 1742. Victoria and Albert Museum. Right: Woman’s gown. Textile design by Anna Maria Garthwaite. Brocaded silk. Made 1742-43, altered c. 1840. Albany Institute of History and Art. Robe a l’anglaise. Silk damask. Ca. 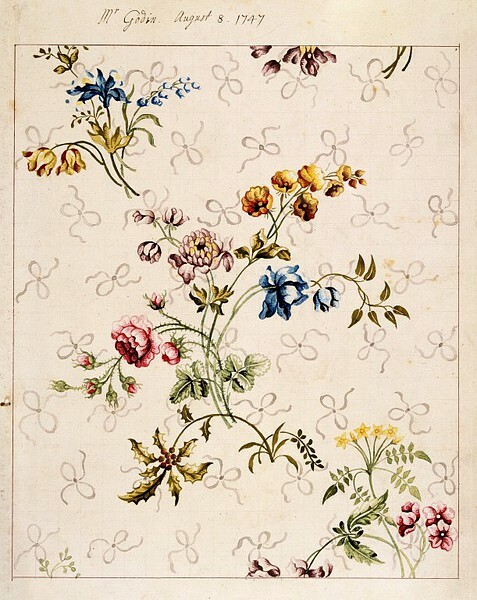 1775, textile 1751. Museum at FIT. 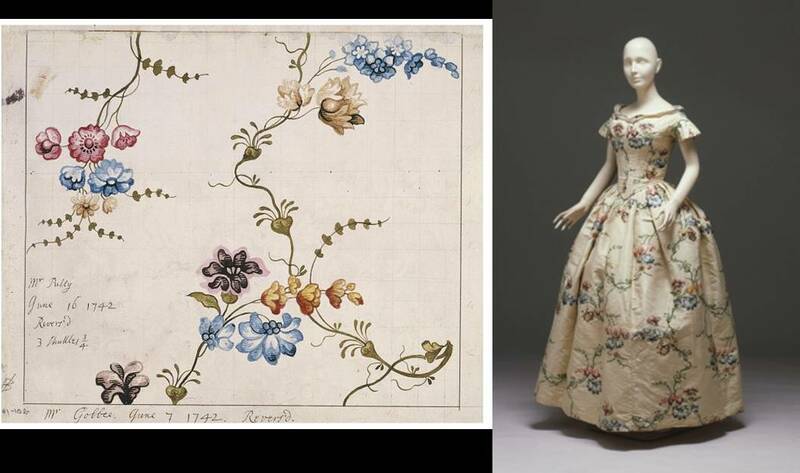 These garments and fragments of textiles are testaments to Anna Maria’s role in the evolution of the British silk textile industry, and the hundreds of watercolors she produced, including technical notes, are testaments to her savvy business acumen. At a time when French silks were in vogue, but Parliament prohibited their use in England, Anna Maria riffed off of French designs and followed the Rococo aesthetic with an added English flair. When Parliament prohibited anything other than British textiles to the Colonies, Anna Maria’s designs became highly sought after, as fashionable American women demanded only the latest in design. The fact that garments made from her fabrics were cut and altered to fit new bodies and reflect new silhouettes in fashion reflect the value placed on the figured silks attributed to her design. English Heritage plaque at 2 Princelet Street, London. Lazaro, David E. “Fashion and Frugality: English Patterned Silks in Connecticut River Valley Women’s Dress, 1660-1800.” Dress Vol. 33., 2006. Rothstein, Natalie. 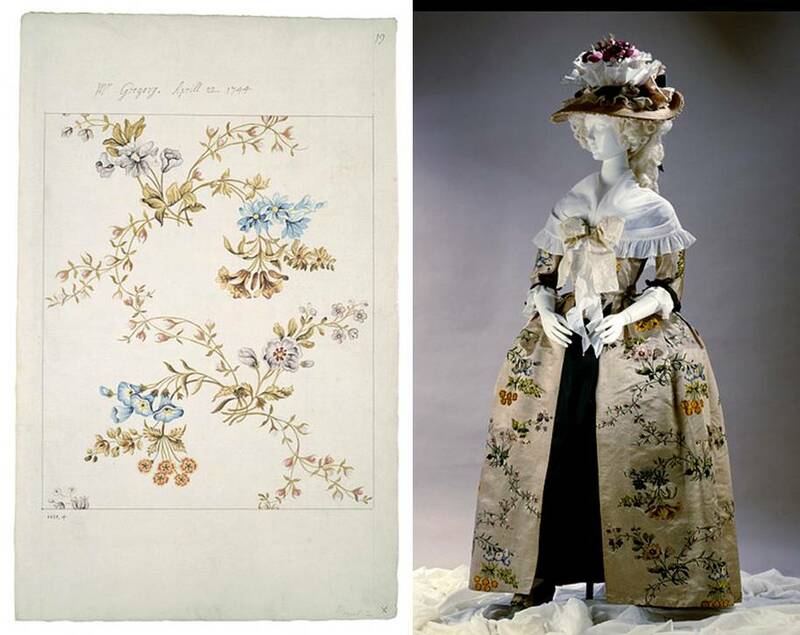 Silk Designs of the Eighteenth Century in the Collection of the Victoria and Albert Museum. London: Thames and Hudson, 1990. This entry was posted in Fashionista Friday and tagged 18th Century Fashion, Anna Maria Garthwaite, History of Fashion, silk. Bookmark the permalink. This is really interesting to read especially since I studied her only a couple weeks ago in my fourth year Art History module: “British Design & Decorative Arts 1750-1915”. I always find it more interesting to chance upon a reading outside of lectures and your images are Great quality too!!! So reading your blog, is definitely NOT procrastinating from my essay reading !!! Glad you enjoyed. Good luck with that essay reading!